This boutique hotel, which also houses the popular restaurant Victor’s Bistro on the ground floor, opened in May of 2013 as part of a revitalized downtown Florence. Interestingly, part of this building was actually built as a hotel at the turn of the twentieth century. The land on which the main building sits once belonged to the North Eastern Rail Road, which the rail company subdivided and sold. In 1891 businessman Henry Rose purchased Lot 51 and built a one-story general store here. The store caught fire in 1899, but the building survived. In 1905 Rose purchased the adjacent lot and enlarged the building to three-stories. The bottom floor housed the store, while the two floors above it served as the Family Hotel. As the years passed, Rose subdivided his building space and leased parts of it to other businesses. In 1908 candy and fruit merchant Louis Palles rented half of the floor space from Rose for his own store. By 1913 Rose had retired, and the Roses sold the property to First National Bank. The ground floor continued to operate as a grocery store for decades to come, the store space leased from different owners. In 1923 the Schofield brothers bought the building and used space on the first floor for their hardware store. The business moved a few years later, and various retail businesses found homes in the building through the years. In 1965 Rogers Brother Fabrics purchased the building. Though they, too, eventually relocated their business, the building remained in the family. The hotel also utilizes its neighboring building, the former Old Florence Bank building, as well as the Jones Smith Jewelers building. Both of these sites were also once owned by Henry Rose. Another hotel called the Hotel Florence previously existed in this Pee Dee city on East Evans Street. Built in 1909, the original Hotel Florence was considered one of the finest hotels in the state and offered state-of-the-art amenities. Sadly, it burned in the mid twentieth century, and its remains were demolished in 1963. 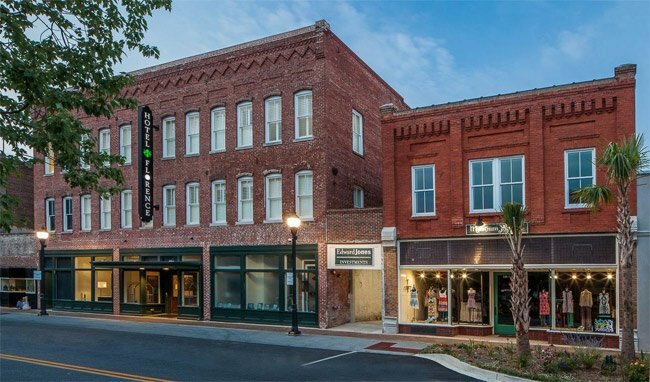 In 2012, the vision of a group of businessmen along with the City of Florence was realized when the Hotel Florence was made anew, again becoming one of the finest hotels in South Carolina. The hotel overlooks the popular James Allen Plaza.